THE ancient and holy city of Mathura, an important place of pilgrimage, is widely believed to be the birthplace of Lord Krishna — undoubtedly, the most popular god in the Hindu pantheon. Located on the western banks of the Yamuna, which wends along its leisurely course to Agra, Mathura has seen the rise and fall of as many civilisations as have the ancient cities of Rome or Israel. From 350 B.C. to 465 A.D., it saw the rise and establishment of Buddhism. This ascendency, however, did not inhibit the peaceful practice of Hinduism and Jainism and the worship of popular local gods. Yakshas and Yakshis — tree gods and goddesses — are popular depictions in friezes of that period. I had read about the rich collection of art treasures at the Mathura Museum and had made up my mind to visit it at the earliest possible opportunity. 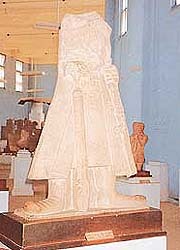 The photograph of the headless stone image of the Kushan emperor Kanishka, had stayed in my mind for years. Said to be the only sculpture of the monarch in existence, I was determined to visit Mathura to see the original, with my own eyes. Somehow, it took me many years to achieve this, as my visits to Agra were always rushed and somehow there was never enough time to stop at Mathura, either on the way to, or on the way back from Agra. 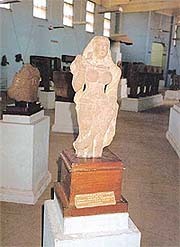 Most people visit Mathura for religious reasons, and have no interest in the priceless antiquities at the Museum. Finally, an opportunity arose three years ago, when I was travelling by car at my own time and pace. A colleague, who wanted a lift back to Delhi joined me on the trip, on the condition that we would take a detour from the main highway, to stop at Mathura, and visit the Museum. But visit it we did and my enthusiasm, must have been somewhat infectious. By the time we reached Mathura, which is 58 km and less than an hour’s drive from Agra, my friend was as keen as I was, and quite ready to spend an hour or two in seeing ancient treasures, that perhaps we may never get to see again. What exactly had we come to see? What period in history did the sculptures represent? Here in this Museum, hidden away from the tourist beat, and far from the bustle of urban cities, lay priceless artefacts from the most important collection of the Mathura School of Sculptures — from 3rd century B.C. to 12th century A.D. Regional in character, the Museum collection consists of the archaeological finds from Mathura and its adjoining areas. On driving into Mathura, we were first directed to the earlier Museum — an ornately carved and elegant building with arches and traditional stone filigree work. This artistic building, located on the main road leading into Mathura, while eminently suitable for housing works of art, became too small to house all the rare objects that kept being discovered in the area around Mathura. A proposal for a larger building, was moved by the provincial government, into whose hands the museum administration had been entrusted in 1926. In two and a half years a new circular sandstone building was partially completed and the objects of art shifted carefully to the new building. The Government Museum was finally completed as recently as 1962 — a modern and rather unimaginative structure, it lacks the grace of the earlier Museum of Archaeology. On reaching the Museum, we were pleasantly surprised to face not the usual apathy encountered at other government museums, but a genuine welcome by four attentive caretakers. Initially, I thought that with visitors being few, anyone who arrived was welcome. But, I discovered a genuine desire to ensure that we did not miss out on seeing any of the important pieces, under their care. Other museum caretakers could certainly learn a thing or two from these old retainers. Hriday Narain, with his shock of white hair looked as though he should have retired a few years ago, but he was the most energetic of the lot. With great pride he introduced us to 35-year old Moolchand Saini, the peon, who had mastered the Brahmi script, and can decipher all the text carved on the stone figures. He is naturally much in demand as a guide, for he also knows much of the history of the place, can read and explain all the text, and details of the pieces. Our visit was a true lesson in history, translated into stone and terracotta. The nomadic Kushan Dynasty, having taken Bactria and Gandhara from the Greeks in the early days of A.D., Kadphises II captured Indian territory as far south as the Narmada, while Kanishka, reigning until 144 century A.D., expanded Kushan territory even further. Assimilating Indian faiths, Kadphises II minted coins with the image of Shiva and Kanishka and became a Buddhist. After the collapse of Kushan dominance, the Gupta dynasty gradually took over from early fourth century. The dynasty reached its peak later in that century under King Samudragupta, a scholar-poet, a musician, as well as an energetic military leader. The Gupta Age was one of Hindu supremacy and poet Kalidasa wrote his best poetry at the court of Samudragupta’s successor, Chandragupta II. It was at this time, that Gupta sculpture and architecture reached new heights of refinement. Much of the history of this period has been learnt from the chronicles of Chinese Buddhist pilgrims like Fa-Hsien who visited Mathura in 402 A.D., and Hiuen Tsang, who saw Mathura in 643 A.D., when Buddhism was already on the decline. 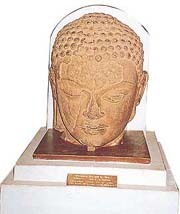 The Mathura school of art adopted the traditions of the early Indian art of Bharhut and Sanchi with strong influences of the Iranian and the Indo-Bactrian or Gandhara art. Starting with the earliest terracotta figures of the mother goddess, the free use of Hellenistic motifs in hairstyles and drapes, and the fusion of the old Indian folk-cults as the worship of yakshas are all important features of this school of art. Another important element is the depiction of the Buddha in human form rather than a symbol, depicted in stone during the Kushan period. At the Mathura Museum one feels close to history, especially when there is someone to read and decipher what is carved on the sculptures. Real history can only be learnt from such archaeological findings, and a visit to this fascinating Museum is better than anything that can be learnt out of a history book.